“That’s so meta” is a phrase you hear bandied about a lot these days. It’s usually used to describe a reference by someone about themselves. Metatheatre is a style of play that acknowledges it is a play within a play—actors are aware of the audience and may interact with them or acknowledge they’re actors and not the characters they play, or they’ll reference props, sets, location, etc. 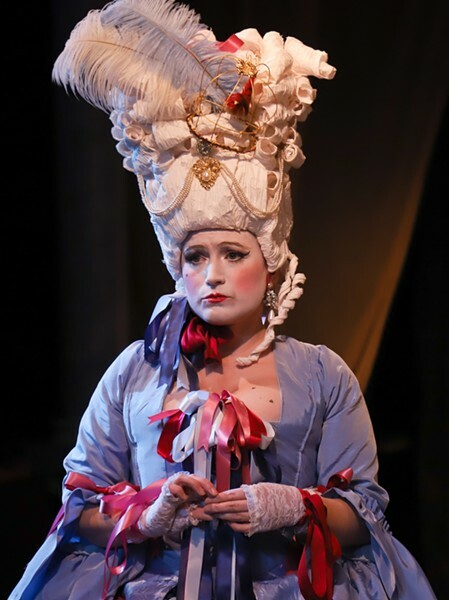 Playwright Lauren Gundersen takes metatheatre to the extreme with 'The Revolutionists', her story of a French playwright’s attempt to write an “important” play about the French Revolution. It’s running now at 6th Street Playhouse through April 7. The play opens with Olympe de Gouges (Tara Howley Hudson) headed for the guillotine until she realizes that’s no way to start a comedy. As de Gouges struggles with writer’s block, she’s visited by Marianne Angelle (Serena Elize Flores)—the only fictional character in the play—a Caribbean revolutionary seeking independence for her island and an end to the slave trade. She needs de Gouges’s help writing pamphlets and declarations. A bellowing at the door heralds the arrival of Charlotte Corday (Chandler Parrott-Thomas), soon-to-be-assassin of Jean-Paul Marat. She’s looking for a memorable last line to utter after the deed. Marie Antoinette (Lydia Revelos) soon joins them and insists she did not say that thing she’s been accused of saying, and just needs better press. Before meeting their fates, these four badasses challenge each other’s place in history and the role of the artist in the world. One remains to tell their stories. Director Lennie Dean has an excellent cast at work here. Hudson is solid as the insecure playwright struggling to find the right words for everything. Flores communicates as much with a look as she does with a page of dialogue. Parrott-Thomas keeps her slightly unhinged character just this side of insane. Revelos takes the cake as Marie Antoinette, managing to be both touching and hilarious. It’s a breakout performance. 'The Revolutionists' has clever characters, great performances, and effective design work that are too-often overwhelmed by Gunderson’s need to wrap it all up in a meta-theatrical cloak, a device that diminishes some interesting points about women in history and the arts. The play would be better if she had used a metaphysical guillotine and cut a lot of it out.